Implied metric modulation is a device used to create rhythmic tension, by giving the impression of shifting to a new tempo or playing what seems to be an unrelated tempo on top of the original one. In the late 60’s, great post-bop era bands like the John Coltrane Quartet and the second Miles Davis Quintet had great rhythm sections which often used implied metric modulation to “shift gears” during solo sections, thus creating a new dimension in the music to surprise and capturing the attention of listeners. One great example of this is the tune “Footprints;” a great track on Miles Davis’s album “Miles Smiles,” in which Tony Williams brilliantly jumps around changing tempos and feels while the band keeps holding the primary metric. At moments, some of those changes seem random, but they are not, they are all related under a polyrhythmic relationship. NOTE: Shaker is playing top line, and cowbell is playing bottom line in both audio examples. There we have a 2/4 bar; the bottom line is playing the original metric, two quarter notes per measure, however, the top line is imposing a new related tempo, by pushing three quarter notes into the same amount of time. 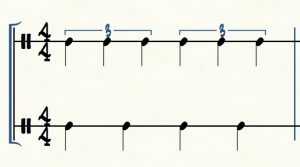 If you play this bar and split each line into a different sound source, you are going to feel the ambiguity of the rhythm. If you pay attention to the bottom line, you will feel the 2/4 pulse, but if you shift you focus to the top line your perception of the rhythm is going to change completely. Your brain is now going to interpret the bar as a 3/4 rhythm. It is that ambiguity of two rhythms happening at the same time which creates the rhythmic tension in music. So, let’s get to work! For this introductory lesson, I am going to be explaining 2 basic and most used metric modulations in jazz. They are 6 against 4 (6:4) and 2 against 3 (2:3). Ex. 2 and 3 respectively. 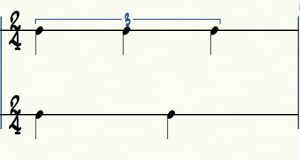 As you can see, the bottom line is expressing the original tempo, while the top line is implying a new tempo. In this case, it is 6 quarters notes per measure in the space of 4. The same thing is happening in example 3; the bottom line is expressing the original metric 3/4, while the top line is implying 2 beats per measure. We need to sense how these rhythmic relations feels in our body. We need to internalize that feeling to incorporate, precisely and naturally, this concept into our vocabulary. Start clapping the top line of Ex. 2 with your hands. Familiarize yourself with the sound of the six beats on top of the 4/4. When you get comfortable with step 1, try to count the 6/4. Immerse yourself in the new metric, and feel it like it is the original tempo. It might take a while, but go for it, it is worth the effort. Once you feel that 6/4, try to sing rhythms and/or solo ideas that you would usually play on that 6/4 tempo. Remember you can also break it down as to 2 bars of 3/4. So have fun and use your solo vocabulary on the new tempo, and think about it as if it is the original one. Get your instrument, and repeat step 3. Now try to go back and forth between the two tempos, play an idea in the original tempo then try to play it in the 6/4 tempo. Trade 4’s, 8’s or 16 bars going back and forth between the two tempos. For this step, you can also use the Learn Jazz Standards Play Along tracks. Try to experiment with it and have fun. Now try picking a tune in 3/4, and repeat all the steps above but with the top line of exercise 3. So we are going to be implying 2 beats rhythm against the original 3/4. Implied metric modulation is a great tool to expand your solo vocabulary; you can use it to repeat melodic ideas but at different rhythmic rates. You’ll see how a simple idea can transform into a theme, thus, making your solos more melodically cohesive and organized. It is also a great arranging device. You can make your entire band modulate to a new tempo in a particular section of a tune or for one specific soloist in the ensemble, etc. Also, it is a great exercise to improve and deepen your time feel and inner tempo, making your foundations solid. Just be careful when using these concepts! All in excess and with no taste can be disastrous; it could make music sound stiff and unnatural. So go ahead, practice, experiment, break the rules, and always remember to have fun.